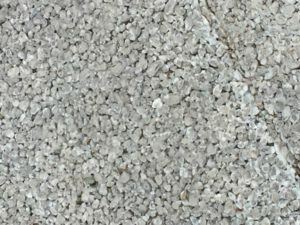 It’s called pervious (concrete) paving and it’s got the attention of an increasing number of designers and property developers. Why? 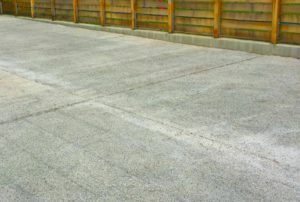 Because it can save money and it’s better for the environment than standard concrete paving. In fact, it’s among the EPA’s Best Management Practices. 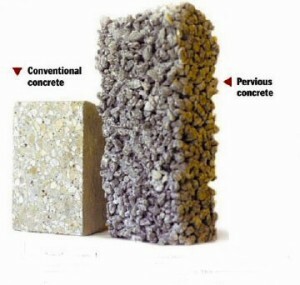 What it is An innovative technology that consists of a porous concrete surface used primarily for driveways and parking lots. 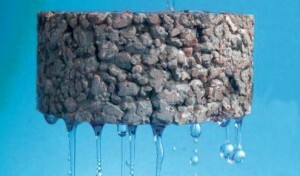 It enables rainwater to drain directly into the soil, naturally filtering it, before running off. Conventional concrete paving is impervious in which uneven surfaces cause puddling and storm water pollution. See illustration below. Water, cement material, with little or no sand, together forms a paste that is applied to crushed stone. The result is a highly porous surface. Illustration on the right shows the difference between pervious paving and conventional. Water filtering treatment; can infiltrate 70%-80% of annual rainfall. Pervious paving (also referred to as porous paving, pervious concrete) satisfies several LEED categories including: water efficiency, materials and resources and innovation in design. There are specific credits that apply. Below is a few. Please ask Gardeners’ Guild for more information and see below for our pervious paving project in Oakland. I drove out to Mountain View Cemetery last week to take some photos of a porous paving project Gardeners’ Guild completed about six months ago. I took some photos and spoke to Craig Nuchols, the Building and Grounds Supervisor. He graciously gave me access to the parking lot, newly paved with the porous concrete material. I asked him what he thought. He was pleased with the results. “It’s doing the job its supposed to do”, he said. The heavy rains this past season was the best way to test their investment. Unlike impervious concrete in which rain puddles in cracks and any uneven surface, the rainfall neatly percolated through. Impressive to see the paving industry moving toward more pervious paving installations. Great option when trying to reduce storm water runoff in the landscape setting, while getting the benefit of groundwater recharge.